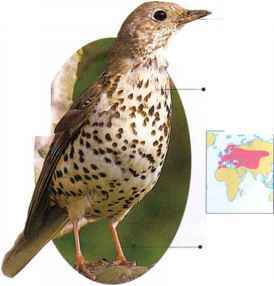 With its boldly spotted underside arid upright stance, the Song Thrush is a familiar bird in well planted parks and gardens throughout northwest Kurope. In the rest of its range, it is purely a woodland bird. It feeds on invertebrates, commonly snails. To eat these. Song Thrushes are seen making regular visits to a chosen stone used as an "anvil" for breaking the shells open. Berries are another important food. • NKST A cup made of plant material, lined with a smooth cup of mud, wood pulp, or clay, in a tree or bush. Kurope, N. Africa, Middle Kast, and (!. Asia. Introduced in Australia and New Zealand.